Inside the apartment building, he and his groomsmen would have other trials to face: drinking vile concoctions of vinegar and wasabi, doing pushups, and liberally bribing everyone for hints to impossible trivia questions. 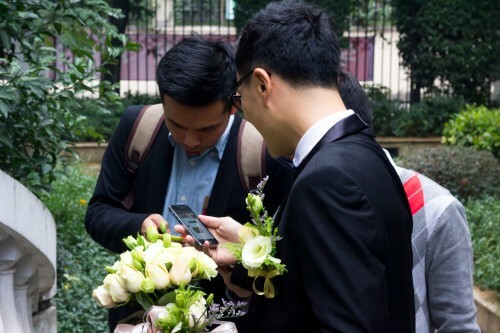 But to get into the building at all, the maid of honor had decreed that he had to post a goofy picture of himself in his groom’s getup to Moments and get 25 Likes from his WeChat contacts. He and his groomsmen huddled to block screen glare and sent frantic requests for help to everyone they knew. Despite being only four years old, WeChat is more popular in China than Facebook is in the US: 72% of all Chinese people with mobile devices use it, versus the 67% penetration rate Facebook has among American internet users. Yet its Facebook-esque feature, Moments, manages to avoid feeling like the Walmart of social interaction. When my soon-to-be cousin-in-law posted that photo, he no doubt received both sincere congratulations from his professional contacts and older relatives as well as jokes from his closer friends. On Moments, however, each user can only see activity from their own contacts: not even a total count of Likes is available to anyone other than the original poster. This automated privacy curtain means that group social dynamics can remain hidden in plain sight without any moderation effort required from the original poster. In other words, my cousin-in-law could perform his groomal duties without worrying about messy (and potentially embarrassing) context collapse. On my own Moments posts, I can see all the likes and comments but my friends can’t see each other’s activity unless they’re contacts on WeChat themselves. This decision to prioritize context separation over the ability to perform social popularity is an important concession to what sociologist Tricia Wang calls the Elastic Self. In a culture where connections are everything, many of WeChat’s features are subtly optimized for “saving face” in complicated situations. You can chat with people without adding them as contacts: someone you met on a chat-coordinated dinner doesn’t automatically become a Contact with access to details about your social life. Even while adding someone as a Contact, there is an option to secretly prevent them from seeing your Moments updates. There’s also a conspicuous lack of presence and typing status indicators as compared to iMessage and other apps, allowing the receiver some measure of plausible deniability about when each message is received. These days, the buzz around WeChat centers on its impressive sprawl into an entire operating system of features: in certain regions, a user can hail a cab, shop, and even manage their bank accounts all in the app. But these features, introduced in late 2013, only work because they capitalize on WeChat’s already dizzying adoption rate. What lies at the core of WeChat’s success is a series of smart design decisions that reflect the culture they were created in and, together, generate a unique experience that is as functional as it is addictive. Considering that there are 2–3,000 Chinese characters in common usage, digital Chinese text input is always nothing short of an UI miracle. Over the decades, we’ve shed some terribly convoluted ways of organizing the characters, settling on three main input formats: phonetic, shape-based, and handwriting. I exclusively use the phonetic method, an absolute godsend for someone who can speak and read but not handwrite; my parents and grandmother prefer handwriting. No matter the method, however, text input still involves a good deal of knowledge about the Chinese language and some degree of searching for and tapping on the character you intended in a grid of contenders. On the small screen of a phone, it’s a strenuous process for anyone without young eyes, tiny fingers, and a firm grasp on literacy. WeChat privileges another mode of communication equally to text: “Hold to Talk.” This featured, used by almost as many people as texting, allows the sender to record a short voice message which is then sent in the conversation. The receiver taps it when they want to hear it, and if there are multiple messages, each subsequent one autoplays. It’s a brilliant feature that marries the intimacy and simplicity of voice with the convenience of asynchronicity that makes texting so appealing. 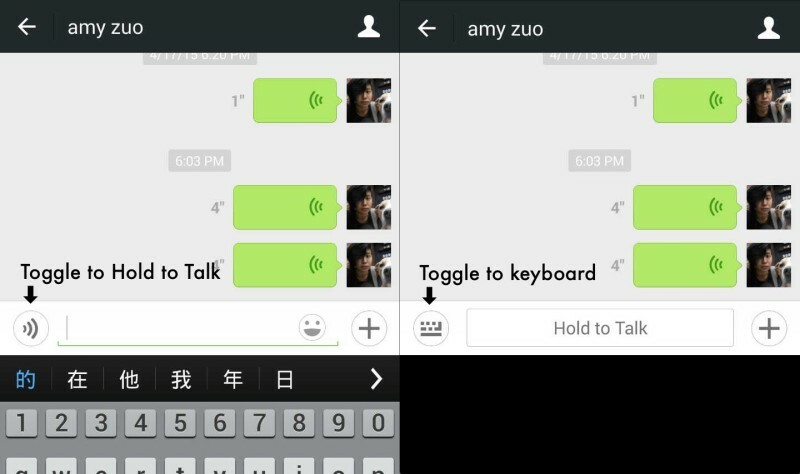 “Hold to Talk” is a top-level alternative to a keyboard in WeChat. “Hold to Talk” may have been created for its convenience, but it’s also a powerfully expressive feature with interesting affordances of its own. In the process of writing this piece, I was thinking about a Chinese phrase I only half-remembered. Forgetting a language is funny — there are some words I can read but not pronounce, and others that I can parse while listening but not recognize visually. I remembered the vague shape and meaning of the phrase, so I sent two voice clips to my mom, fumbling the words awkwardly. An hour later, she responded with a voice clip of her own. I listened to her laugh and rib me about my illiteracy, and chuckled alongside it as if she were next to me. The sidewalk we were grilling on was at least ten hours and three buses away from the nearest airport. 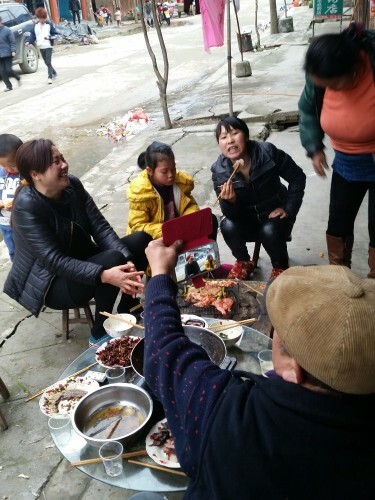 That Tricia and I — two Chinese-Americans — could and had traveled so far to visit Nanzhai village was a big deal, and so we were being treated to our third epic barbecue in as many days. As our host families cooked, they waved down almost every passerby, trying to entice them to join the feast. Most refused, but the ones who joined revealed a tangle of relationships running through the village. Periodically, one of our hosts would pull out his phone (a Samsung Galaxy S4, possibly shanzhai) to shoot video clips of the gathering, documenting everyone who was there. Other relatives crowded around the phone afterwards, watching all of the videos on the phone. They were so interested in the videos taken of our hosts’ lives in Beijing, where they lived for most of the year as migrant workers, that they went to desperate measures to attempt to copy them. 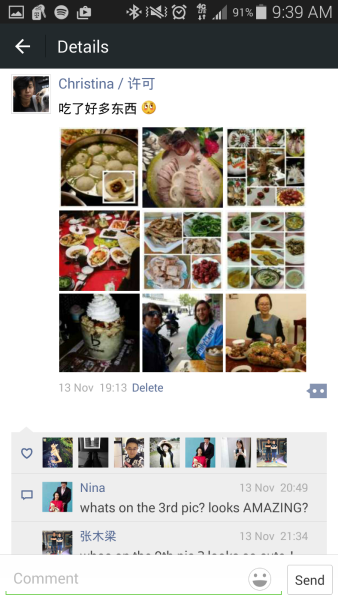 WeChat natively supports a surprising number of media formats: images, custom animated stickers, uploaded videos, natively captured short videos called Sights, and even PowerPoint and Word documents. It also facilitates passing these files from one conversation to another through a prominent “forwarding” option for files. Now that my 80 year old grandmother is on WeChat, the whole family forwards anything amusing they find to the group chat we share so that she can see it. Often, it’s jokes, articles, and photos of ourselves and our food. One day, my dad sent over this absolutely bizarre video. Because it was a Sight, captured directly in the WeChat app somewhere across the world, it autoplayed in the chat stream. The sharing patterns around Sights are particularly fascinating: since these short videos lack any landing page whatsoever, they circulate entirely through the grapevine, following ties like the ones that bound the villagers at the barbecue to each other. Each one I receive feels like a glimpse into a window only a few connections away. I learned how to rip Sights from WeChat that day so that I could start sharing these glimpses of everyday comedic genius with the American internet on Vine and Tumblr. While the videos, Sights, and links that make the rounds on WeChat could be described as chain mail, they also serve an important need for the increasing number of families forced apart across the country or the globe because of far-away opportunities for work and schooling. The circulation of any media at all maintains family ties. These oddities are the hearth around which people gather to share a comfortable moment of ambient copresence, even if they are miles and timezones away from each other. Scrolling through my WeChat today, I see pictures of my cousin and cousin-in-law surfing and glowing on their honeymoon, pictures of my parents from a friend’s graduation ceremony, at least five jokes I can’t quite grok, and even the occasional dispatch from Nanzhai village. Using a chat app to hail a cab with your phone is cool, but at the end of the day the killer feature of WeChat will always be its ability to shorten distances and navigate social situations as deftly as we need to. This essay also appeared on Chrysaola Weekly.